Vigorous, stocky habit, freely producing large bicoloured flowers of yellow and brownish red, with dark brown centres. 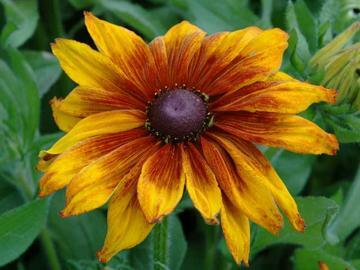 The colour shading varies slightly between individual blooms, giving an interesting mixture of bright and dark flowers. Short-lived perennial normally grown as a half-hardy annual. Moderately fertile, moist, well drained soil in full sun. Not frost hardy, and normally dies off after flowering. Bedding and borders, cut flowers.